your diet might be making you sick. We know that sometimes your diet is the problem. Every day, millions of people eat food that they think is healthy and nourishing. In many cases they are doing more harm than good. Each body is different and has unique nutritional needs, food allergies, and sensitivities. It can be daunting trying to figure out what you should eat if you have cancer, crohn’s or graves disease, or Hashimoto’s. We’ll plan and prepare meals suited to your illness so you can relax and focus on reclaiming your health. DO YOU KNOW WHERE GLUTEN IS LURKING? This FREE GUIDE will help you find the hidden sources of gluten that you may not even be thinking of! You may not even know that you have an allergy or intolerance. But, your body does and it will react. Sometimes the signs are subtle. Maybe you feel bloated, have sinus congestion, or abdominal pain; these are most likely indicators of a food sensitivity. If you have an allergy, the body’s response can be more dramatic and dangerous and, in some cases, result in death. Over time, if you continue to eat foods to which your body is intolerant, your autoimmune system will be triggered. In its attempt to protect you from foreign invaders, it can turn on you, instead. When it does, you can develop any number of autoimmune diseases, such as type 1 diabetes, celiac, rheumatoid arthritis, lupus, Hashimoto’s Thyroiditis, psoriasis, multiple sclerosis, and many more. We know food is medicine and we know just what to put into your body (or not) depending on your unique needs. Are you eating gluten free? We’ve transformed your favorite foods so you can enjoy them. A personal chef isn’t a luxury if you need assistance with sourcing meals that fuel your body and help sustain your health. For those who have health issues, dietary needs, or just want to sustain overall health, we’ve got your back. You will always know exactly what’s going into each meal — no more guessing, we do the legwork and read all the labels for you. You shouldn’t have to worry about what food to eat for your optimal health. Together, we’ll assess what you need and deliver meals that satisfy and sustain your overall well-being. Dining out is difficult when you have food sensitivities or allergies. We deliver restaurant quality meals that you can feel safe eating. There are multiple food sensitivity tests on the market. This test from ARCpoint labs measures boh IgA and IgG antibodies. And, because The Pickled Beet is the exclusive chef partner in South Florida for ARCpoint, you’ll get a discount off your food sensitivity test. Just enter THEPICKLEDBEET at checkout. Do you have a disease, food allergy, or sensitivity? At The Pickled Beet®, we know that food is medicine and what you put into your body can heal or harm you. Executive Chef Liz has extensive experience designing menu plans for several health issues, including diabetes, heart-related, cancer, renal failure, autoimmune disorders, and extreme food sensitivities. Whether you need a gluten or dairy free menu, have a nut or shellfish allergy, or want to avoid eggs, we can help. We take the confusion out of what you should eat, so that you can focus on healing. We have thousands of time-tested recipes that have been modified to fit every medical malady or food restriction. We don’t repeat an entrée in a six-month period unless you request it. With our meals, you’ll always know exactly what’s in them, so you can relax and enjoy meal times again. Imagine opening your fridge to find a variety of nutritious, delicious meals created by us especially for you. Scouring labels and sourcing recipes that fit into a restrictive diet is time-consuming and overwhelming. With our personal chef service, we’ll take the work and worry out of what you eat, saving you hours each week. We understand what you’re going through is difficult and we want to help, so we’ll take the time to listen and formulate a customized plan because you’re our number one priority. 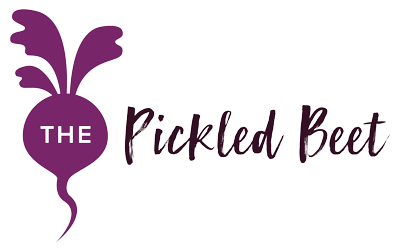 At The Pickled Beet® we treat every client as an individual case. Maria Cerro is a single mother of two who is battling the autoimmune disease, Hashimoto’s Thyroiditis. We began cooking for her when she started an elimination diet prescribed by her functional medicine doctor. She cannot have gluten, soy, dairy, grains, most starches, peppers, nightshades, legumes, artificial sweeteners, seasonings derived from seeds, fruits, and more. Her protocol is so restrictive, we’ve had to create a cookbook-sized database of recipes just for her. In the months since we started cooking for her, her health has improved dramatically. What’s the difference between a food allergy and a sensitivity or intolerance? A food allergy triggers an autoimmune response that involves multiple organs and can be quite serious. A food sensitivity or intolerance usually produces less dramatic symptoms when the offending food is ingested, but the reaction can become more severe over time with repeated exposure. What if I’m healthy and I want to stay that way. Can food help? Yes! The path to good health begins and ends with your gut, quite literally. Your diet has a direct impact on the strength of your immune system and your body’s ability to ward off illness. My doctor didn’t say anything about modifying my diet. How do I know if I should? On average, U.S. medical schools only offer 19.6 hours of nutritional education as a part of their curriculum. As with all aspects of your health, it’s up to you to become informed and make educated decisions. I’ve been diagnosed with a disease, can a modified diet help? Yes! Dietary changes that are specifically designed to address your health issue will increase your body’s ability to manage and, in some cases, help reverse your condition. Since the mid 90s, the number of Americans suffering from chronic medical maladies, such as heart disease, asthma, cancer, and diabetes, has nearly doubled. What’s changed since then? The food we eat. – 50 million Americans have an autoimmune disorder. – Autoimmune disease is one of the top 10 leading causes of death in females from childhood to age 64. – One autoimmune disorder makes you 10 times more likely to develop another one. – More than 20 million Americans have thyroid disease; 90-95 percent of them have Hashimoto’s Thyroiditis, an autoimmune disorder. Most have food sensitivities that exacerbate their illness. – More than 100 million U.S. adults are now living with diabetes or prediabetes, a condition that can become type 2 diabetes.